It’s mid-March and feels that way. But the wind and cold air haven’t deterred a couple dozen Triangle-area residents from gathering in NC State’s Schenck Forest, an urban forest just 10 minutes from the university’s central campus. They’re part of the university’s Osher Lifelong Learning Institute (OLLI), a lifelong learning program for adults age 50 and older, and they’re here to pack nearly 1,000 tree seedlings in preparation for Arbor Day. 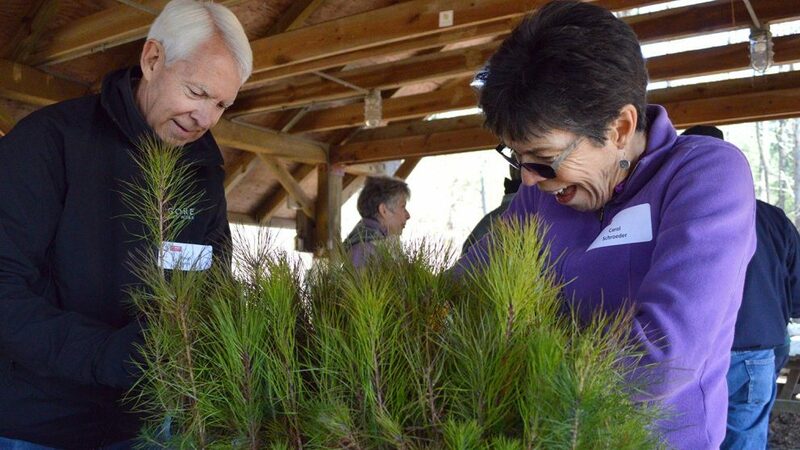 OLLI members David Helm, left, and Carol Schroeder organize pine tree seedlings in preparation for Arbor Day, when the seedlings were given away at the State Farmer’s Market in Raleigh. Gutmann is one of 1,500 members involved in OLLI, which offers classes, study trips and special events designed to cultivate learning after retirement. Many of the most popular OLLI programs relate to sustainability, and that’s no coincidence. “If our classes are full, it says we’re interested,” Gutmann says. Recent sustainability-related classes have focused on North Carolina’s smart cities, climate change, ecology, water quality, public transit, container gardening and food systems. In addition to lectures and classes, OLLI has offered recent study trips to venues such as the U.S. Environmental Protection Agency, North Carolina’s state parks and the Bayer Bee Care Center. What Hardman-Cobb has seen time and time again among OLLI members is that knowledge leads to action. Not only do members regularly report implementing sustainable practices featured in classes, they often share the information with others. After touring one of the area’s largest recycling facilities, one OLLI member walked door-to-door in her neighborhood educating residents about common items that are and are not accepted in curbside recycling bins, as well as what to do with items that could be recycled at a different facility. Helga Gutmann has been an OLLI member for seven years and often takes part in volunteer opportunities such as preparing tree seedlings and information cards for Arbor Day. “People are interested in the environment. Our members are aware, concerned and want to give back and get connected,” says member Linda Shell, whose career included coordinating volunteers for a nongovernmental organization. Now, Shell gives back by offering OLLI members a monthly volunteer opportunity such as packing tree seedlings for NC State’s Department of Forestry and Environmental Resources or sorting clothing at a local nonprofit that serves the homeless. For Menestres, a retired high school teacher, being in the classroom again has been a highlight of his OLLI involvement. In addition to attending classes, he has taught OLLI sustainability-related classes about bees and gardening. According to Hardman-Cobb, this type of member learning and engagement ‒ whether it’s in program planning, teaching or as a participant ‒ is why the program was originally founded in 1991 as part of NC State’s McKimmon Center for Extension and Continuing Education. Formerly the Encore Program for Lifelong Enrichment, the program changed its name to OLLI and joined a nationwide network of 120 OLLI programs in 2014 after receiving funding from the Bernard Osher Foundation. Many members say that OLLI fills an important role and purpose in their post-retirement lives. After Gutmann retired nearly a decade ago, she didn’t know what the future held. Published in Community, News, Newswire, Uncategorized.